Last summer, the National Park Service issued a little-noticed bulletin with this tidbit. The northern Midwest, including the upper Great Lake region, has warmed by almost 4 degrees Fahrenheit in the 20th century. Data for Lake Michigan, Huron and Superior show that summer water temperatures are increasing. 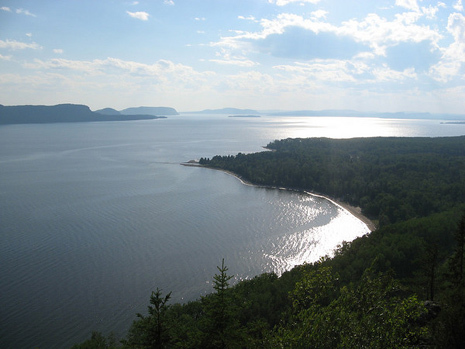 Lake Superior’s summer surface water temperatures have increased by 4.5 degrees Fahrenheit since since 1980. This week top resource scientists gathered in Duluth to add a few more details to the story of the swift warming of Superior (see pix), the greatest of the lakes. According to data presented at the “Making a Great Lake Superior Conference,” the lake’s average winter ice cover is 50 percent smaller than it was 100 years ago. Since 1980, the water on average in summer has warmed almost 2 degrees Fahrenheit per decade, which is twice as fast as the air has warmed. During that time, wind speeds in the middle of the giant lake also have risen steadily. Record drought in Georgia, causing a severe water shortage and emergency measures to conserve. Record fires in southern California. A six-year drought on the Colorado Plateau that has lowered water levels in Lake Powell, along the Colorado River, to less than half of full capacity. And Lake Superior at the lowest levels in recorded history. Do you think these events are related? Do you think that the changing climate has a role, a central role? Do you think they ought to start talking about this in Lansing? I do. Fresh water, as my colleague Andy Guy is fond of saying, is Michigan’s ace in the hole. Hey man , thanks for writing but this article doesnt format correctly when using Firefox it is showing only half the page.